Five fraternities on Albion College’s campus use plastic foam cups as their main source to carry their beverages outside the house. About 1,000 cups are ordered each week. Most are thrown away after one use. This waste adds to a growing list of problems that threatens Earth today. Last week, the Intergovernmental Panel on Climate Change released their climate change report, citing that humans are the sole reason that the Earth is experiencing massive fluctuations in climate. Each time a plastic foam cup is thrown away, it heads straight for a landfill where it will sit for years. Plastic foam does not decompose. This takes up space and pollutes the environment that it is in. Plastic foam with a “6” recycling code on it can be recycled by some recycling facilities. The Albion Recycling Center is one such facility. The fraternities order plastic foam cups because it is cost-effective, easier to use and included in meal plans for the members. “We do have some washable cups, but the issue we run into is that it makes dishwashing a lot longer since we only have two people who are responsible for that job,” said junior Delta Tau Delta member Alex Tokie of Traverse City, Michigan. DTD took a step toward eliminating plastic foam cups last semester when junior fraternity member Chris Breen of Royal Oak, Michigan, proposed that they stop using plastic foam cups. The fraternity was able to successfully cut out all use of the cups for a time. “I wanted DTD to stop using [plastic foam] cups due to the mark they leave on the environment, since they don’t degrade. Unfortunately, we started using them again,” said Breen. Breen is hoping that DTD can return to the plan it adopted last semester. Reducing waste and setting an example for other individuals is of the utmost importance in the fraternity. Ultimately, lower price options led the fraternity back to using plastic foam cups. Sigma Nu uses plastic foam cups as well, but only for to-go cups of coffee. Otherwise, straight plastic cups are used for holding beverages, said junior Coleman Schindler, Sigma Nu president from Elk Rapids, Michigan. These cups do not contain foam but still contain plastic that does not decompose. “We use the styrofoam because our meal plan included those cups,” said Schindler. Sigma Nu uses Bon Appétit Management Company, Albion College’s food provider, as their food and utensil provider, so the fraternity does not have a lot of power as to decide what type of cups will be used. Bon Appétit is dedicated to eco-friendly action, however, as they have recently pledged to eliminate all plastic straws from its 1,000 cafés in 33 different states by September 2019. They are the first food service to make this commitment company-wide. 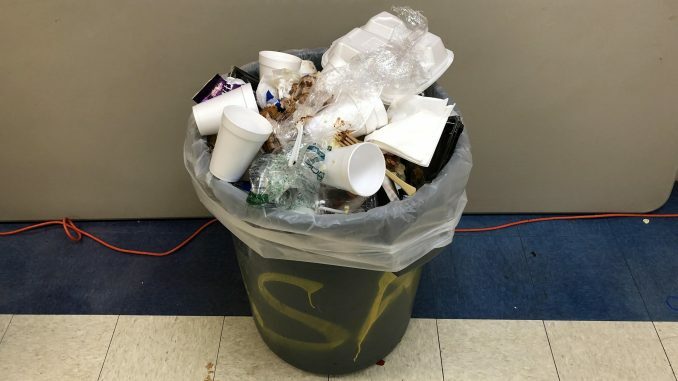 The fraternities are trying to figure out how to maintain the ease of living with plastic cups while also trying to help the environment. As of now, there is no future plan for change in Delta Tau Delta or Sigma Nu in plastic cup orders. There are individuals who would like to see change, but the sacrifice may be too large because of how cheap the plastic cups are right now. Alternatives to plastic foam cups can include switching to compostable cups or washable plastic cups. This may mean a major shift away from previous practices for the fraternities, but a few individuals in the fraternities are already calling for a change in order to do their part in saving the environment.